Need to convert MS WORD (or any other) documents to PDF? With PDF Annotator you can turn practically any document into a PDF with a few simple clicks. 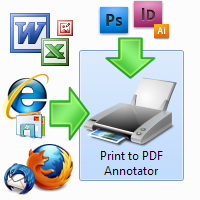 When you install PDF Annotator, a "virtual" PDF printer is installed. This means any Word document can be turned into a PDF. Simply go to print your document from MS Word just as you would normally, then under the "Select Printer" option, select "Print to PDF Annotator" instead of your desktop printer. This will convert the Word document into a PDF instantly. The PDF Annotator print engine works with Word, Excel, Web Pages, and many more. Download a free trial of PDF Annotator today and simplify your document notation workflow. PDF Annotator is designed for computers running Microsoft® Windows®. Enter your email address and we will send you the link to download and install PDF Annotator on a computer running Windows®.